Did you know that gotu kola, a treasured herb used to treat all kinds of health conditions for centuries, was traditionally used to heal leprosy? In fact, the herb has a great reputation as a skin-healing agent, perfect for sensitive skin. This beautiful green herb works like aloe to help the skin. Considered a creeping perennial, the plant likes to spread out over the ground, and tends to have larger leaves when grown in the shade. Flowers are typically pink and appear in groups of 2 to 4 in a cluster or “umbel,” but they are so small that they often go unnoticed. Seeds grow in flat, oval capsules, typically with two tiny, brown kidney-shaped seeds. Gotu kola has long been thought of as the “spiritual” herb, used by yogis to help improve meditation, said to help develop the crown chakra—the energy center at the top of the head—and to balance the left and right hemispheres of the brain. The herb is also very popular in Ayurvedic Medicine, known as the promoter of long life. The leaves were said to boost the immune system and to promote restful sleep. According to the University of Maryland Medical Center, the herb has shown in studies to have many health benefits. Science has found gotu kola may help reduce swelling and improve circulation. Chemicals called “triterpenoids” in the plant have shown in animal studies to increase mental function. 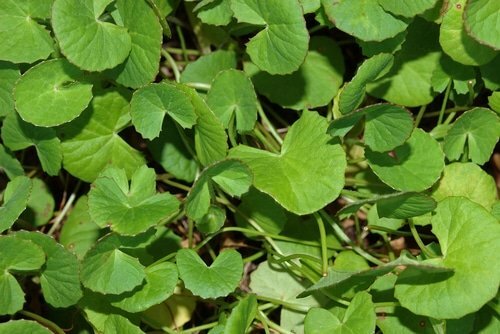 One human study found people were less likely to be startled by a new noise when taking gotu kola. Another small human study revealed that those taking gotu kola had improvements in mood, memory, and cognitive function. Limited studies have also shown the plant to have potential in helping to soothe joint pain and promote restful sleep. Gotu kola is rich in triterpene saponins, known to firm and tighten your skin's appearance. Gotu kola is also rich in flavonoids with good antioxidant activity, which helps protect from environmental stressors, and may be particularly useful in the winter. In addition, recent research has found extracts from the plant to be successful anti-aging ingredients. A 2011 study, for example, found that the antioxidant activity was comparable to that of grape seed extract and vitamin C.
This herb is applicable in any anti-aging or healing skin care product, so I've added it to all of the following. Do you use gotu kola in your daily regimen? Laurie Barclay, M.D., “A Scientific Solution to Unsightly Cellulite,” Life Extension Magazine, August 2008, http://www.lef.org/magazine/mag2008/aug2008_A-Scientific-Solution-to-Unsightly-Cellulite_01.htm. Molecules. 2011 Jan 28;16(2):1310-22. http://www.bulkactives.com/abstracts/centellaasiatica.htm. Exp Dermatol. 2008 Nov;17(11):946-52. Epub 2008 May 21.